So you’ve decided you like the sport of Ultimate, and you’ve decided to join Warwick Bears. What comes next? You almost definitely already know about our regular weekly training sessions (hopefully you’ve attended one or two), open to every member of the club. These are the sessions where you will learn all of the basic fundamentals of the sport, and eventually build into some more learning more advanced techniques and strategies. But the club has more to offer you, if you’re willing to work for it. The club this year has two extra training squads on top of the general “open to all” squad, each of which is in place to provide experienced players with extra opportunities for more advanced learning and competitive play. While they’re currently only open to experienced players, we will likely start adding keen freshers into these squads as soon as the end of term 1/start of term 2. As long as your fundamentals are solid enough and you have shown your commitment and your will to work hard and improve, you have a good chance of being invited into these squads. This squad provides players with two extra outdoor training sessions on top of the usual “everyone” sessions, which run for the 2 hours before the general outdoor sessions (ie. 12-2pm Wednesdays, 11am-1pm Saturdays), as well as one extra indoor session a week (7:30-9am Tuesdays). These sessions are very similar to the general training sessions, but focusing on more advanced techniques and strategies – these are the sessions where all the experienced players do their learning and improving. Members of this squad do not have an attendance requirement, but are expected to be committed to the club. They are in this squad because of their will to improve, and they do need to show this in the way they train. You can look to be invited to these trainings quite soon as long as you show rapid improvement, good potential, and most importantly that you are willing to work hard and train hard so that you can improve quicker. We value the hard work and dedication of our players above anything else. This training squad is aimed at players looking to play competitively with Warwick Bears in the 2017-18 BUCS season, be that with the women’s team or the men’s firsts or seconds. Players are welcome to this squad as long as we judge their ability good enough to not significantly slow down other players in the squad. They are invited to one extra training a week (on top of the DTS and general trainings), which runs late on Monday evenings and is focused entirely on running fitness/conditioning drills as well as playing high intensity games to build team chemistry and execution. Members of this squad will have their attendance tracked at training sessions, and their commitment to the club is a huge factor in team selection. They are also expected to put in work on their own outside of training sessions (strength training, extra fitness or throwing, whatever you have time for). We will start inviting new players into this squad very soon after we have started adding them to the DTS, and if you show your commitment to trainings and to the club you can very reasonably expect to be playing for one of the BUCS teams at nationals! The competitive university season is split into two divisions, indoors and outdoors, which are further split into three categories: women’s, men’s and mixed. The indoor season is just beginning, with University Mixed Indoor Regionals taking place on the weekend of the 28th/29th October. It will be followed closely by Men’s Indoor Regionals and Women’s Indoor Regionals later in the year, both of which we’ll likely be sending a team of the most committed, hard working freshers to as we believe this to be a great way for you to get competitive experience against some of the best teams in the region (don’t expect to win many games though). This indoor season culminates with nationals for all three categories, you’re however very unlikely to play at these events as a beginner (the competition is already very tough for experienced players, and places on the 1st team are very limited due to indoor’s small team size). The outdoor season however is a different beast entirely. The mixed and women’s divisions play a regional qualifier to get into a nationals event during term 2, and keen freshers (particularly women, simply due to numbers) have a very good chance of being selected for these squads. The men’s season however runs through a continuous league system, run by BUCS (British Universities & Colleges Sport). We have two teams entered into this league, with our first team being in league 1 and our second in league 2. 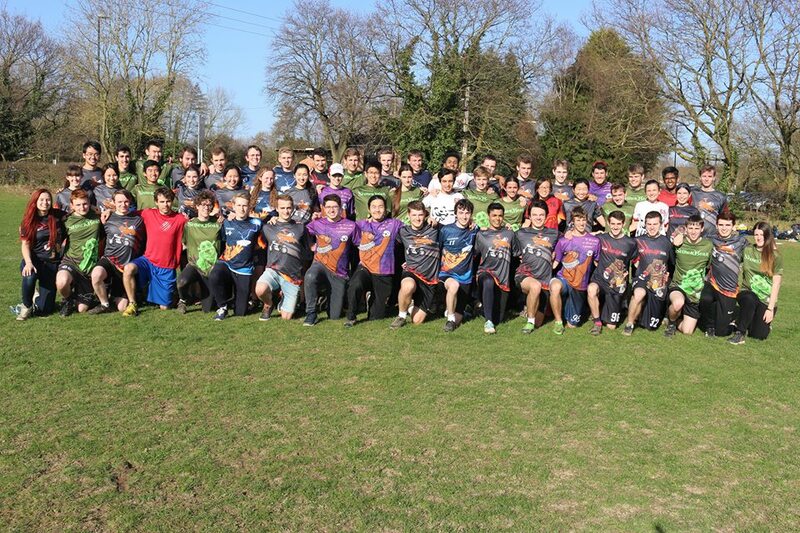 It’s almost guaranteed that some frisbee freshers will be playing games with Bears 2 by the end of the year, and there is the chance that you could be playing for Bears 1 as a fresher if you’re particularly talented and work hard enough for it. We reward players based on their commitment and their ability, years of experience do not matter. The men’s and women’s seasons both culminate in the biggest university event of the year: Men’s and Women’s Outdoor Nationals which usually takes place just before the start of term 3. All of our training, all of our hard work is in preparation for this event, and you can be present to. The women’s team almost always takes one or two freshers with them by nationals, and the men’s second team will usually have a few (although this year will be particularly competitive as there are a lot more experienced players than usual fighting for spots on the BUCS teams). If you already can’t get enough of frisbee, you’ll be pleased to know that Ultimate is far bigger than just a University sport. Once the University season ends, the club season starts! Stretching from March to September, the UK club season is comprised of 6 open-to-all major tournaments (called the “Tour” events, we’ll tell you more about them later in the year), 3 of which are for teams in the mixed divisions and 3 in the men’s/women’s divisions, in addition to mixed/men’s/women’s regionals and nationals events which take place during the summer. 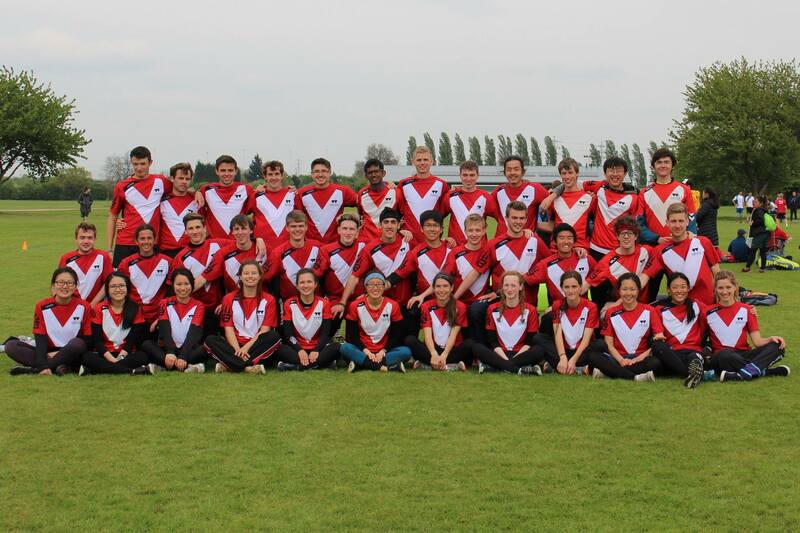 The highest finishing teams at UK Nationals then also go on to play in the European Ultimate Championship Finals (EUCF for short) every year, as well as some World events every few years – the World Ultimate Club Championships take place every four years, with the next ones taking place in 2018 in Cincinnati, and the World Ultimate Championships (equivalent of the Football World Cups as nations compete for gold in several divisions) last took place in London in 2016 and also take place every four years. The best club in the area, EMO is a regular top of nationals contender, and have made Euros several times in the past. They are one of the top teams in the country and we encourage all of our experienced members of the club to go train with them (they host open training sessions towards the start of the season, on Tuesday nights). We also encourage experienced members to tryout for this squad, and we usually have several members make the squad every year. You most likely won’t play with them in your first year, but it’s completely reasonable to tryout for them in your second year and you’ll most likely have a good chance of making their training squad (even if you only end up playing for their second team at first, it’s still an opportunity for some really high quality trainings). A relatively new team to the club scene, Hydra has quickly become one of the best women’s teams in the country and provides an amazing opportunity for women of all ability levels to attend high quality trainings and play with a very good team at tour events (they enter both a first and a second team into every tour event), as well as regionals and possibly nationals. A very high quality club which is reasonably easy to train with as all you need to get there is a short train journey. They are a regular team at nationals, but don’t usually push for the spots into international competitions. The trainings are really high quality, and you don’t need to tryout to make the team and attend their trainings as everyone is welcome. If you are looking for some extra training opportunities, and a very good team to play with during the club season, we recommend every experienced player look into playing with Birmingham. A completely open-to-all team, every woman in the club (freshers included!) is encouraged to attend their trainings as a great way to get extra training under their belt. They welcome players of all ability to play for them at tour events, providing every one of their members with the opportunity to play with and against some of the best women in the country. They’re also considering running their trainings concurrently with EMO’s Tuesday evening sessions, meaning that travel should be quite cheap and easy as a lot of us head to Leicester together. There is no reason whatsoever not to train with Leamington Lemmings as an experienced player. All their trainings are free, and in a very convenient location (Newbold Comyn Park in Leamington Spa). In fact, we encourage all freshers to look into training with the Lemmings as soon as the club season starts as they’re not only an extremely friendly bunch of people but also provide a great opportunity to improve faster as you not only get the extra training opportunities with more experienced players but also might get the opportunity to play with them at Tour events. By next season you might be ready to trial for and make one of the EMO or Hydra squads. By the year after you might be a club captain, and possibly part of the Great Britain 2019 U23 World Championship squad! That’s not exaggeration, it’s extremely realistic: this club has had 70+ graduates represent their Nation and 90% of them started playing at University. For now focus on training hard, listening, learning, and asking questions. You’re going to improve so quickly over the coming year, you won’t believe it. There were a lot of things outside of the University season not covered in this post, so please ask experienced players about Windoors, Bears Holiday, Bearsfest, Bearnefactor Cup, BURLA, Hat Tournaments and any other words you overhear but don’t understand. I had joined two of fresher sessions and got a lot of fun there.But I missed the later training sessions because I did not make payment at that time. So what should I do right now to follow up the coming events and training sessions?